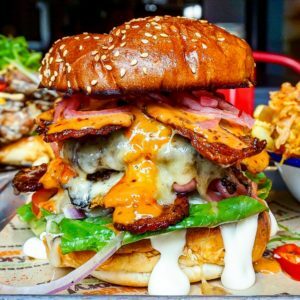 Burger Theory burgers are filled to bursting point with freshly cooked ingredients that deliver a satisfying and great tasting wholesome meal for exceptional value! Everything possible is homemade and all the meat is sourced from well managed, British farms where the animals are given enough space to roam. Find them in the Victorious Food Court! Their burritos and quesadillas are big, delicious and healthy! Stuffed full of thyme braised black beans, spinach rice, sour minted cream, guacamole, Monterrey Jack Cheese, salad, roasted garlic & lime cherry tomato salsa, Jalapenos, roasted pepper sweat chilly sauce and served with vegetarian chipotle mushrooms, orange braised beef, or smokey chicken. Catering for vegetarians and vegas too. Find them in Street Food Way! 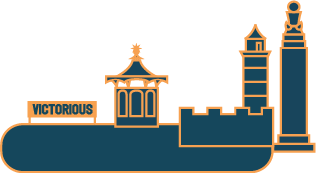 ChilliDogs will be bringing their unique handcrafted hotdogs made from100% British pork, no added nasties, just pure meaty goodness to Victorius 2018! 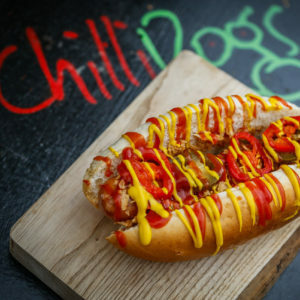 Why not try their delicious ‘dogs’ topped with slow-cooked chilli or cheese fondue for a dog to keep the party going! Find them in the Kids Arena! Fancy something sweet? 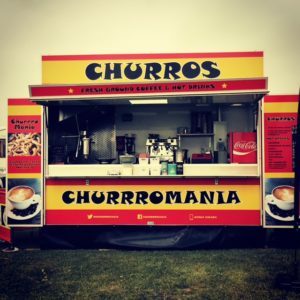 Head to Churromania and sample some of their incredible Churros; delicious fried dough pastry dipped in chocolate and loved by millions! Yum! Find them in the Seaside Stage Arena. This family-run business specialises in authentic Nigerian dishes, using recipes that have been passed down through generations of their family. All of their dishes are gluten, dairy, soya, sugar and wheat free with options for Vegans & Vegetarians. Be sure to check out their beautiful stall in the World Music Village and sample some authentic African cooking! Goodness Gracious Healthy Foods is an award-winning festival caterer. 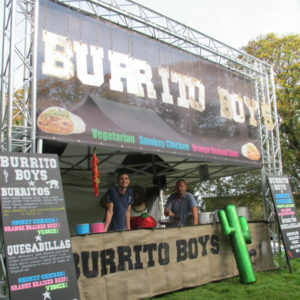 Not only have they been voted caterer of the year at the UK Festival awards but they also received Glastonburys Silver award for their ‘Green’ impact on the environment. 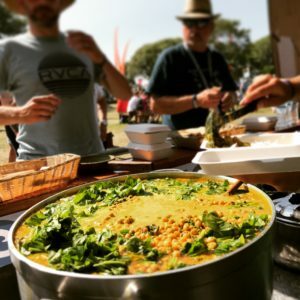 Offering up a healthy alternative for festival-goers they serve vegetarian and mostly Vegan food with gluten-free options. Why not try their Spicy Mexican burger or falafel with grilled halloumi and hummus! Their Antipodean style Barista coffee is also the perfect pick me up! Find them in the Food Court. Serving up tasty Arepas! Gluten-free and grilled white corn pockets filled up with a variety of fillings. Meat, vegetarian and vegan options as well. 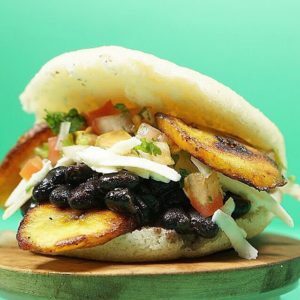 Guasacaca freshly prepares cornbread arepas from scratch providing an authentic, amazing flavour and experience to customers. Also on the menu is the Yuca Frita (Cassava Fries) with avocado, Guasacaca sauce and habanero chilli sauce. 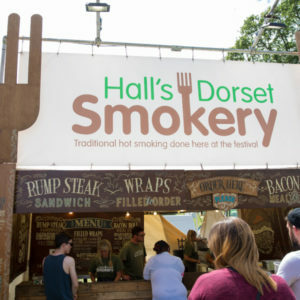 Halls Dorset Smokery smokes a selection of tasty meat and cheeses and serves them in a wrap jam-packed with loads of fresh salads and their notorious sauce. They also serve up a cracking steak sandwich loaded with smoked onions. Heaven! You can find them in the Common Stage Arena. Happy Crepes started over 10 years ago, because the owners loved food and music. Their crepes and galettes are always prepared from special recipe, using Organic Buckwheat and White Stoneground Flour. All of their food is prepared from scratch in front of customers, using fresh fruit and veggies, so whether you’re after something sweet or savoury they’ve got it covered.They also offer many Vegetarian and Gluten Free options. 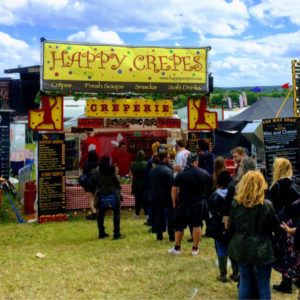 Victorious Festival go-ers love Happy Crepes so much, you can find them in two places! In the Common Stage Arena and the Food Court. 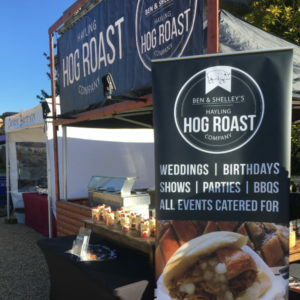 Gourmet hog roast specialists based just up the road on Hayling Island! Offering up a delicious traditional hod roast plus their signature ‘rustic wedges’ (potato wedges topped with beef chilli, cheese, soured cream and chives). Find them in the Victorious Kids Arena! Los Churros Amigos was born by one man’s first taste of happiness in 2012. The moment that deep-fried, doughnuty, tentacle of joy hit his lips, he knew what had to be done. Six years later after perfecting our unique recipe, they found the ultimate mix between traditional Spanish heritage and the British sweet tooth. 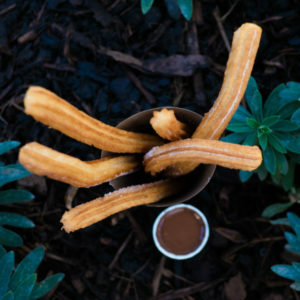 Freshly made from scratch in front of you, with organic flour and completely vegan ingredients, their churros are served with thick melted Belgian chocolate sauce. Devine! Find them in the Common Stage Arena. Pimp my Fries are passionate about re-inventing the classic french fry. Fries are no longer just the sidekick to a meal. Their perfect crispy golden fries have sides and toppings of their own! Offering a variety of variations of classic, seasoned and curly fries. 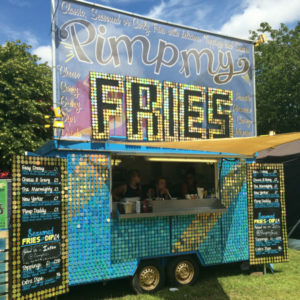 Whether tucking into something simple like our “Easy Cheesy” or “Marmighty” fries, or going all out with our famed “New Yorker” or “Pimp Daddy” Special, you’ll find nothing better than the treat of pimped fries to thrill and comfort at any event. Trading out of a unique, pimped up, sequin trailer, they are sure to put a smile on everyone’s face while offering a unique pimped take on classic chips and dips. Find them in the Food Court. All aboard Shippy Chippy! 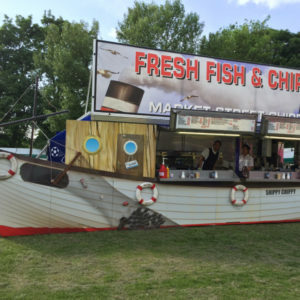 What better place to sample their fresh fish and chips than at a festival by the sea. A true seaside experience. Their unique boat-shaped stall can be found in the Food Court. 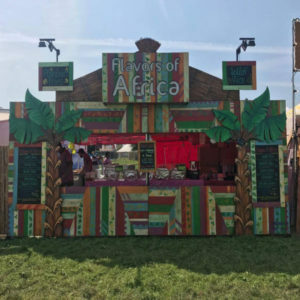 A rare find on the festival circuit, Taste Tibet offers unique and delicious Himalayan soul food, served from a stunning and colourful nomadic Tibetan tent! The BBC Good Food Magazine has called Taste Tibet a ‘hidden foodie gem’, and they were included in the Guardian’s Top Ten picks for Oxford. Get in line for their legendary Tibetan momo dumplings (vegan or beef) and an amazing spread of gluten-free Himalayan curries. The Taste Tibet chilli dip contains special ingredients from Tibet. Don’t miss this unique taste experience! 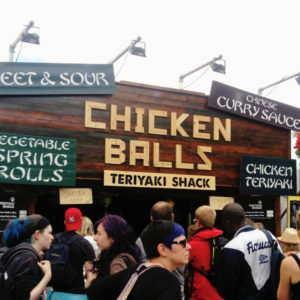 Teriyaki Shack specialises in serving up perfectly cooked Chinese chicken balls, vegetable spring rolls, rice and a variety of incredible Oriental sauces, including sweet & sour, teriyaki and Chinese curry sauce. Their vegetable spring rolls are suitable for vegetarians and vegans alike, and the chicken they use is British and free-range. They can’t wait to see you this Summer! Find them in the Food Court. The Mixing Jug – we pour, you stir! 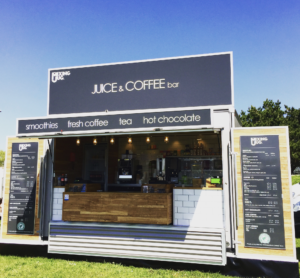 Along with powerful smoothies and iced drinks they’re now serving their award-winning, sustainable coffee over-ice! Perfect for keeping you hydrated or a much-needed festival caffeine boost! They pack all their smoothies & iced drinks in non-plastic, plant-based cups too. Win! Find them in the Common Stage Arena and the Food Court. 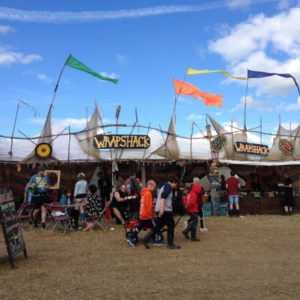 The Wrap Shack offer a unique festival dining experience and serve up mouthwateringly tasty wraps stuffed with lovingly cooked Spanish and Mexican fillings. 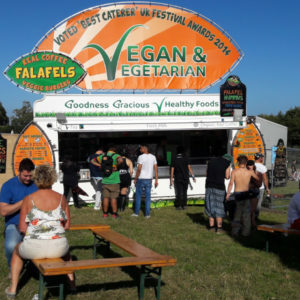 With meat, veggie and vegan options available, they are the perfect pit stop for any festival-goer. Plus all their food is gluten, dairy and nut free. Find their amazing shack in the World Music Area. 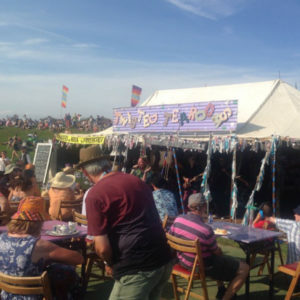 The Twisted Tearooms is a place where you can come, sit and enjoy hot and cold food or a pot of tea and a slice of cake whilst taking in what the festival has to offer. Find them in the Seaside Stage Arena. 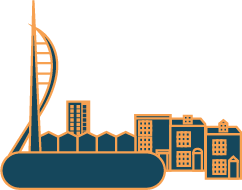 Wild Thyme Wholefoods is a worker’s co-operative based in Southsea, UK. They aim to bring you food that is wholesome, natural and plant-based. 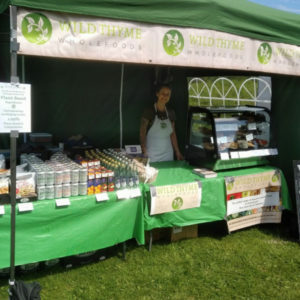 At their stall you’ll find a range of healthy wraps, salads, cakes and savouries which will all be vegan with options for gluten-free, sugar-free etc. Not only will you be supporting local small businesses but they are also non-profit so we can deliver all this to you at a reasonable price, plus all our packaging is compostable and plastic free! Wow! 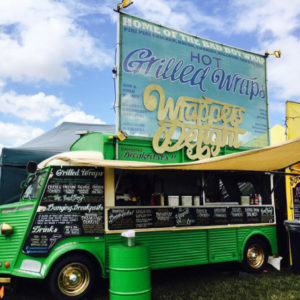 Wrappers Delight specialise in delicious veggie, vegan and meaty hot grilled wraps. For example halloumi and sun blushed tomatoes, Chicken and bacon BBQ melt and the infamous Bad Boy Wrap! The wraps are wholesome and served with homemade hummus, fresh crunchy salad and are crammed to the brim with lots of flavour. Find them in the Common Stage Arena. This is just some of the wonderful food that we have on offer at Victorious Festival. You’ll find food from all over the world spread out across the site making it easy and convenient for you to sample some of the incredible dishes available. Enjoy!